Despite PM ordering Bennett, Shaked, to shelve High Court override bill, Bennett insists legislation will be voted on as planned. 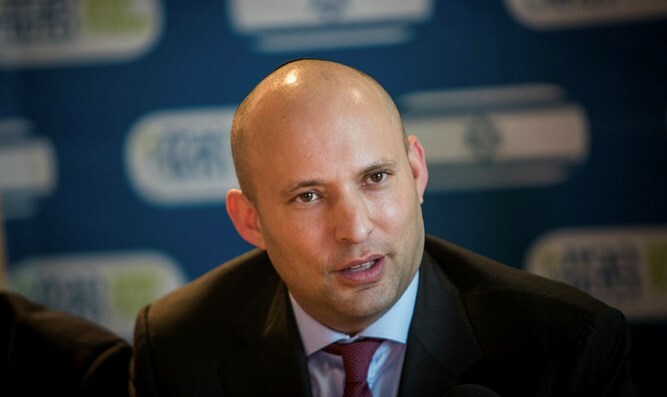 Education Minister Naftali Bennett (Jewish Home) said that he would refuse to shelve legislation overriding Israel's High Court of Justice despite being ordered to by Prime Minister Netanyahu. On Thursday, Netanyahu told Justice Minister Ayelet Shaked not to advance the "Override Clause” supported by Jewish Home chief, Education Minister Naftali Bennett. The premier told the Jewish Home party that he wants to wait another week before bringing the bill before the ministerial committee for legislation on Sunday in order to reach a compromise with Chief Justice Esther Hayut. Bennett said he would refuse however, opining that the bill is "essential for governing". "The paragraph of overcoming is required to govern the government and to maintain trust in the court. It is also an essential means of fighting terrorism and removing illegal infiltrators from Israel. It's time to decide," Bennett said. "Therefore, on Sunday, we will bring up the Override Clause, and we expect the Prime Minister's support, as promised by his signature and as promised to the Israeli public. " The proposal would add a clause to the Basic Law: Human Dignity and Liberty, explicitly empowering the Knesset to overrule the Supreme Court and reenact laws nullified by the Court. Under the Jewish Home-backed bill, the Knesset could override Supreme Court rulings tossing out laws with a simple majority of 61 MKs. While most laws require only a majority of MKs voting at any given time, the Override Clause would require a majority of the full 120-member Knesset. Bennett has in the past demanded the Likud party back the proposal, citing agreements obliging the ruling party to support efforts to restrict judicial review. "Our demand to enact the clause with a majority of 61 Knesset members is no surprise. The Likud signed an explicit coalition agreement with us. Agreements must be fulfilled. I expect the full support of the Likud next Sunday. We will return the proper balance of powers to the branches [of government]” said Bennett last week. In an interview two weeks ago , Bennett said the Supreme Court had assumed the powers of the executive branch, and was throwing out laws on a regular basis. “The Supreme Court has tossed out nearly 20 laws in the last few years, and that is outrageous,” continued Bennett.